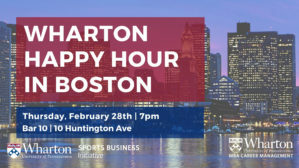 Please join the Wharton Sports Business Initiative, current Wharton undergrads, MBAs and the Wharton MBA Career Management Office for an alumni happy hour. We anticipate many of you will be in town for the MIT Sloan Sports Analytics Conference and would like to do some networking in a casual environment. Come and catch-up with your former classmates and the current students in the sports industry on Thursday, February 28th at 7pm.